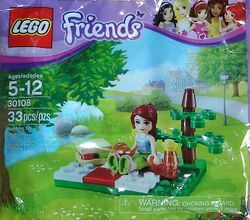 30108 Summer Picnic is a Friends set released in 2013. In the United States, it first appeared in Target stores in February 2013. Facts about "30108 Summer Picnic"
This page was last edited on 9 January 2016, at 07:43.